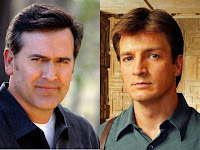 Evil Dead News - News Related To The Evil Dead Franchise: Nathan Fillion: the new Bruce Campbell? Nathan Fillion: the new Bruce Campbell? A theory has been formulating in my head for a long time now. Every time Nathan Fillion pops up in a film or on the TV, I can't help but think of similarities to Bruce Campbell. No one should take this as an insult, since Nathan Fillion has become more mainstream than Campbell and has clocked up over 500,000 followers on his personal Twitter page. Yet for me, his career choices and his dedication to his fan mirror that of Bruce.